Rafael Nadal will return to Miami to take part in the 2014 Sony Open Tennis event after missing the event last year. At the start of the 2013 ATP season Nadal was coming back from a knee injury and withdrew from the event. A three time runner up in Miami, Nadal is hoping to add the ATP World Tour Masters 1000 event to his resume of wins on the ATP tour. MIAMI, Fla. (sonyopentennis.com) – Individual session tickets for the 2014 Sony Open Tennis event are on sale December 1 and tennis fans will once again have the chance to see Spanish superstar Rafael Nadal. After missing last year’s event due to doctor’s advice, world No. 1 and 14-time Grand Slam Champion Rafael Nadal will be returning to the purple courts in 2014 looking to claim his first Sony Open title. In 2013 Nadal recorded on of the greatest comeback seasons in tennis history. After missing nearly seven months due to a knee injury, Nadal returned in February and posted 75-7 record, won 10 singles titles, including two Grand Slams, and regained the World No. 1 ranking. Secure your tickets and experience the most glamorous event on the WTA and ATP World Tour calendars. 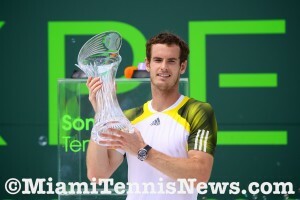 The 2013 Sony Open will be held March 17-30 at the Crandon Park Tennis Center and will once again feature the world’s top players competing for one of the most prestigious titles in tennis. The Sony Open offers a full day of entertainment for everyone. Enjoy the beautiful Miami weather, stop by one of our high-end retail stores, spend time with friends at one of our many lounge areas, try some of our diverse food options or hang around the entertainment stage to listen to live musical performances. Even if you are not a tennis fan there is always something for you to enjoy on the tournament grounds. Experience first-hand why the biggest names in music, entertainment and sports visit the Sony Open each spring. Whether it is LeBron James, Dwyane Wade, Kim Kardashian or Owen Wilson you never know who you may see around the site. In addition to ticket packages the Sony Open has a limited number of Patron Sponsorships are available. These highly sought after sponsorships do not become available very often and include box seats for all Stadium sessions, one Crandon parking pass for every two seats purchased, Patron listing at the front entrance, box seat name identification and six vouchers for meals at the Champions Club presented by ITAU. These seats won’t be available long so call today. Vacation Packages are also on sale. If you are planning a trip to Miami for the Sony Open then let us take care of your hotel and ticket arrangements at one low price. Packages are inclusive for two (2) guests, which includes three nights at one of our partner properties, plus tickets to the sessions of your choice for the 2014 Sony Open. Don’t miss any of the action. Secure your seats for 2014 and watch the best players in the world as they battle on the purple courts for one of the most coveted titles on tour. For more information go to www.SonyOpenTennis.com or call the Sony Open ticket office at 305-442-3367. For over seven decades, since 1936 to be precise, Great Britain has been restless for a homegrown male victor at the All-England Club. Today, it got to uncork that seventy-seven year old bottle of bubbly as Andy Murray held off Novak Djokovic 6-4, 7-5, 6-4 to claim his initial Wimbledon title and his second career major. Last season after the disappointment of losing in the Wimbledon final, Murray bested Djokovic in the semifinals and Roger Federer in the next round to earn Olympic Gold in London a few months later. That feat along with having a major under his belt, the 2012 U.S. Open, were undoubtedly confidence boosters as Murray sauntered on the court to compete. With Rafael Nadal and Federer knocked out in the first and second round respectively, Murray was expected to walk into the final. 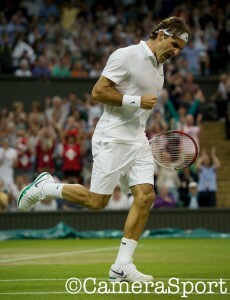 However, in the quarterfinals, the Brit had to overcome a 2 sets to none deficit against Fernando Verdasco. Also, in the semifinals, Murray surrendered the first set before ultimately taking control against newcomer Jerzy Janowicz. Subsequent to beating all comers in straight sets, Djokovic needed five against an injured Juan Martin Del Potro who kept coming back from the brink in the longest semifinal in the tournament’s existence 4 hours and 43 minutes. When Djokovic and Murray collided in the 2013 Australian Open final, Murray never broke despite a myriad of chances. So, when triple break point for Murray came and went in the opening game, the nail biting began for the spectators. Later, with a forehand up the line volley winner, Murray had his seventh break point of the initial set. He converted with a backhand down the line winner. However, the public’s joy was ephemeral. Because of a slew of miscues, Murray dropped the next game at love and the set was leveled at 2 all. No Roger Federer, no Rafael Nadal, and now no Juan Martin Del Potro. Always a marquee draw, especially at a tournament sometimes known as “the Latin American slam,” Del Potro lost his opening match at the Sony Open on Friday evening. The Argentine lost to Tobias Kamke 7-6(5), 6-1 in one hour and 50 minutes. Del Potro, coming off a runner-up finish in Indian Wells, led 5-2 in the first set and even had two set points in the eighth game. Not only did the world No. 7 fail to close the deal, but he also squandered a mini-break lead in the ensuing tiebreaker. 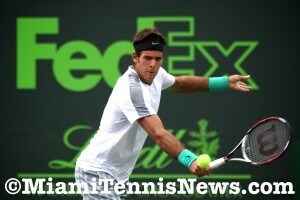 After a rain delay halted play for two hours in between sets, a listless Del Potro had nothing left in the tank. Kamke raced to a 5-0 advantage before serving out the match with a routine hold at 5-1. Although the German’s victory made for a shocking result, it was by no means the most bizarre event of the day. Early on in the night session, not long after Del Potro’s setback, a power outage blacked out the grounds and delayed the action yet again, this time for 30 minutes. Two time defending Sony Open Tennis champion Novak Djokovic begins his title defense on Friday. Prior to his first match in Miami, the world number one player sat down with members of the media on Wednesday afternoon. Djokovic answered questions about the absence of Roger Federer and Rafael Nadal in Miami, a potential semifinal encounter with Juan Martin Del Potro and the upcoming Serbia vs. US Davis Cup match. He concluded the interview by asking members of the media to smile for a picture to post on his twitter account. You can see the picture by clicking here. Q. How do you feel playing this tournament without Roger Federer and Rafael Nadal? NOVAK DJOKOVIC: Well, it’s the same for me. I look forward to this tournament and I have had plenty of success in Sony Ericsson Open in last five, six years. It’s the first Masters title that I won in 2007, and I’m sure that even without them we will have a great tournament. Q. How are you feeling here and the courts and everything? Have you been here a few days? NOVAK DJOKOVIC: Yeah, I practiced, and actually going to practice now again. I like it. I like the conditions. It can be quite humid, but, you know, these weather conditions are different from Indian Wells and from other tournaments, which is normal to expect. It’s not the first time I’m in Miami. So as I said, I had plenty of success in the past. That gives me a reason to believe I can do well again in this tournament. Q. I’d like to know about your yoga. Is it true you practice yoga every day? Q. I’d like to know since when and how does it help you in your tennis? NOVAK DJOKOVIC: Well, I don’t spend much time doing it. I do a combination of stretching and exercise, breathing exercises and something that can, you know, help me align myself and find the inner peace and also work on this breathing through movements kind of exercise, you know, that can improve my flexibility and better movement of the joints. That’s what I use it for, and I like it. Q. Would you consider Sony Open to be a fifth Grand Slam? NOVAK DJOKOVIC: Well, it’s difficult to say, because there are eight, nine 1000s, or as they used to call them, Masters tournaments, that are kind of the same level. It’s tough to pick one which is just behind the Grand Slams. But if you have to make a small group of tournaments out of this eight, nine tournaments, you know, Masters level, Miami would be definitely one of them that is just behind Grand Slams. Q. Today the US Open or the USTA announced the US Open will increase their prize money quite a lot through the next few years, and also that starting 2015 they will be in line with the same schedule of Thursday/Saturday for the guys, Friday/Sunday for the girls and a Monday final. Your reaction? NOVAK DJOKOVIC: Yeah, well, we have been talking with them for quite a while now, and it’s a positive step to see the prize money increase. It’s a good response, and it’s, you know, a reaction from US Open towards the players’ demands and desires. And as I said before, we all have to stay united. We all have to try not just as players, but also the people from the tournament side to work towards improving this game and the world of tennis. So, you know, Grand Slams are huge competitions. They are over two weeks long and there are a lot of benefits. Without players, those benefits are not possible. So I’m sure that a lot of players will be happy with this prize money increase. And to be honest, me personally, I am not happy with a Monday final. But it is the way it is for next two years. I think we have to accept it, and then after that, it all goes back to normal hopefully for Sunday final like every Grand Slam has. Q. Can we go back to Indian Wells for just a second? After your loss, you had said that lack of concentration and focus was probably, you know, the main reason. How often does that happen to you, and are you generally able to pull yourself out? How difficult is it to sustain such a high level of concentration on a consistent basis? NOVAK DJOKOVIC: Well, I think it’s the biggest challenge for a tennis player. At this level you have to be consistently successful, and in order to be consistently successful to be one of the contenders for top place, you have to be concentrated from the first to the last point in every match that you play. Most of the matches that you play, in the opening rounds especially, you’re the clear favorite to win those, and that’s where it can be quite dangerous because the lower‑ranked players have nothing to lose against you. You are going into the court knowing that you’re expected to win. You know, it’s not an easy thing ‑‑ it’s easier said than done, really, to go out there and keep the focus going and try to stay grounded, and, you know, fight for every point regardless who is across the net. So that’s why it’s a big challenge. But it happens. It happens to everybody. Everybody has ups and downs through the match, through their careers, you know. I have lost my match in Indian Wells, a very close match, almost three hours against a Grand Slam champion, you know, against an established top‑10 player, Del Potro. I haven’t lost against, you know, a less quality player. But, again, a few points decided the win. I could have prevailed, but I didn’t. That’s sport. You know, when you lose you try to understand what you did wrong so you can get better for the next one. Q. Beyond the tennis, how do you like coming to Miami? What’s your favorite thing about Miami other than playing the matches here? NOVAK DJOKOVIC: There is a great energy about the city. You know, I have been staying in Key Biscayne Island for last few years, so most of my whereabouts are here on the island because of the tennis. It’s very convenient, very close to the hotel, beautiful weather. Obviously South Beach is something ‑‑ is a very special location in the city where you get to have a lot of great restaurants, places to see, to visit, a lot of young people. Just a very alive city. It’s interesting to see. It’s interesting to always see and visit once in a while. Q. Just going back to the USTA, is that more evidence that the players are really kind of working together at the moment and getting a lot of progress made on that kind of issue? NOVAK DJOKOVIC: Indeed. It’s a very positive step for players. You know, it proves that players I think are more united than ever. I believe that these are some significant changes, you know, in the negotiations with Grand Slams. It hasn’t happened for I think ever or for many, many years that we have such increases. We just feel like we deserve it. You know, there is a lot of players, not just the top players, but a lot of players who are in top 100, top 200, who deserve to, you know, have a better living from this sport. You know, so this is, as I said, a great, great move forward, and hopefully we can achieve many more things together. Q. On your match against Juan Martin Del Potro last week, what are your thoughts on his level of play, and what would you do different in case you encounter here in semifinals? NOVAK DJOKOVIC: Well, it’s still a long way to talk about eventual semifinal matchup with Juan Martin. Still have to win many matches to that point, as well as he does. As I said, a few points really decide the winner in Indian Wells. I was 3‑Love up in the third set and had some game points for 5‑4 in the third, and then, you know, he also played really well. There’s no question about it. He deserved to win, because in the important moments he was the player who stepped in, who was going for the shots and being more aggressive, and that’s why he deserved to be a winner. Q. We know what you do really well, but if there are things you don’t do well and can’t do and you’d like to turn that around and do some of those things really well, what would that be? NOVAK DJOKOVIC: Hmm. Well, your best change is day to day, right? You can’t always expect yourself to play on the 100% of your abilities, you know, and you try to adjust to the feeling that you have that day, you know, kind of general feeling, and you try to maximize your possibilities. There are things that are always open in my game for improvement. There is room for improvement. I feel that I still can improve a lot of shots in my game, you know. I still feel that I can serve maybe better in some moments. I still feel that maybe I can come to the net a bit more often. So it’s actually very encouraging for me, because I like to work, you know. I like to practice and try to improve my game and get my game to best possible level. So that’s a positive, you know. Q. I was meaning not in tennis. Q. I didn’t want to interrupt you. NOVAK DJOKOVIC: Not in tennis? NOVAK DJOKOVIC: But in what way? Q. You know, let’s say you’re a bad singer and that’s what you would really like to excel at, that sort of thing. Like Serena said, she can’t sing and she’d love to sing. So something you can’t do you don’t do well but you’d like to really do well. NOVAK DJOKOVIC: (Pause.) Okay. That’s a good question. I love all the sports, so I would love to play golf and basketball a little bit better. Even though I love cooking, I think I’m not so good at it. So I think I have to improve there. That’s enough. I will tell you in the next one when I think about it a little bit more. Q. Considering the big start of the season of Juan Martin Del Potro, do you think he’s coming this year to approach finally the top four players? NOVAK DJOKOVIC: It can be, but I don’t think anybody can really predict what’s going to happen. If he has the quality to do that? Yes, he does. He has the potential. He’s an all‑round player who can play equally well on any surface and he has proven that last few years. Now it really depends, you know, if he can sustain this level and physically be fit enough to play on that high level throughout the whole year, because that’s what it takes to, you know, to be in top four. Q. If I can ask you to look ahead a little to the Davis Cup and your thoughts on that, and if you know anything about Boise and what Idaho is famous for. Yeah, it’s not a big place, but they say that they have a huge stadium, like capacity of 12,000 people. Hopefully it’s going to be a full, packed house, because you always like to see many people coming to watch tennis. It’s going to be the first time that we all go to Idaho. I have some friends who live in Sun Valley which is close by. I wish I had a little more time so I can go and ski a little bit. But, you know, considering the Davis Cup tie against United States, who is the most successful country in the world in that competition, I think that fact says enough about the quality of and the tradition that this country possess about this competition, about this sport in general. Even though they don’t have a top‑10 player, but still they have good quality players, like Isner and Querrey who are showing their great potential always when they play in Davis Cup. I mean, Isner beat Federer; he beat Simon; he beat the top guys in Davis Cup. He loves to play for his country. It will be in an altitude over 800 meters, I think. That goes to their favor I think because of the big serves. Anything is possible, really. I mean, for now, I am committed to Davis Cup. I will first try to focus on this tournament, see how I go, but the way things stand I want to play and I want to bring my country another win. And before we go, can we just make a photo for Twitter from here? You all have to smile, please. Rafael Nadal has pulled out of the 2013 Sony Open to rest his left knee. On the advice of doctors, Nadal will return home to rest and strengthen his left leg in the lead up to the clay court season. Nadal is expected to return to the ATP in April to play in Monte Carlo. “We are disappointed to hear the news that Rafael Nadal will not be competing in Miami this year, especially given his strong results since his return to the Tour. He is a tremendous ambassador for the game and has thousands of adoring fans here in South Florida. We wish him well and hope to see him back in Miami next year. The Sony Open is looking forward to a tremendous two weeks of tennis with the likes of two-time defending Australian Open men’s champion Novak Djokovic, defending Olympic gold medalist and US Open men’s champion Andy Murray, 2013 Australian Open women’s champion Victoria Azarenka, reigning French Open women’s champion Maria Sharapova and defending Wimbledon, US Open and Olympic champion Serena Williams competing against the rest of the world’s best players here in Miami”.